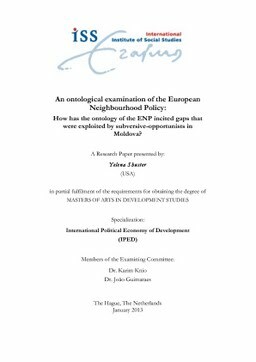 Erasmus University Thesis Repository: An ontological examination of the European Neighbourhood Policy: How has the ontology of the ENP incited gaps that were exploited by subversive-opportunists in Moldova? Many academics and policy makers have proposed that the European Union (EU) is a key external actor in the democratic transformation of postcommunist countries. In this research paper, I examine one projection of the EU's external governance – the European Neighbourhood Policy (ENP) on the democratization process of the Republic of Moldova, a small country in Eastern Europe. The ENP is part of a political framework that links closer economic integration with the institutionalization of specific institutions. By exporting an institutional framework that is meant to increase the capacity of the Moldovan state to ensure the implementation of reforms, the ENP is meant to inspire marketization, through the development of rules and policies intended to complement and strengthen the efficiency of market institutions. As such, it is an indirect model of democracy promotion, promoting democracy and liberalism side by side. In this paper I examine the ontology of the ENP to show how it has inspired gaps that were exploited by subversive-opportunists in Moldova. By linking the ENP’s design to an ontology that holds relative costs to be the primarily incentives of political actors, I show why the ENP is techno-managerial and power insular. Then using the Moldovan state as a unit of analysis, I illustrate how political legacy and power dynamics have influenced implementation of the ENP. Then I show how the Party of Communists of the Republic of Moldova (PCRM) exploited ambiguities for interpretation and implementation of emerging institutional reforms in the media sector to alter the outcome of the reform process in ways that promoted their political interests.